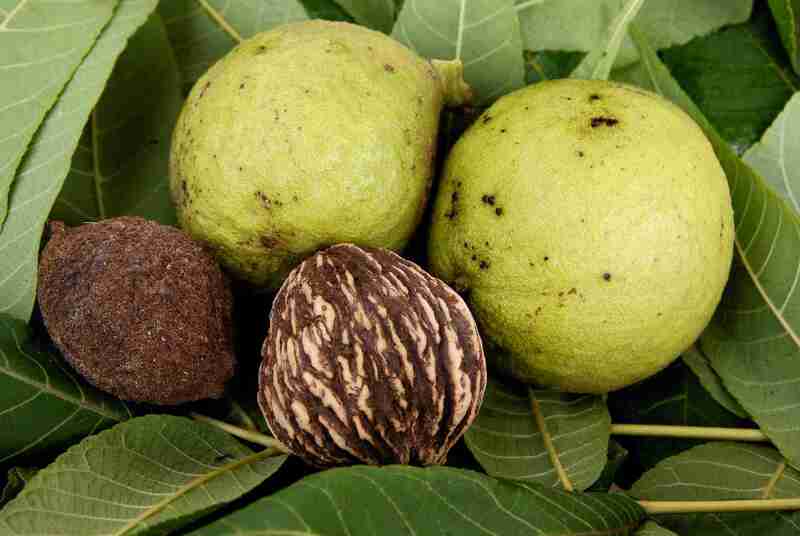 Have access to a black walnut tree, and interested in harvesting the nuts? Here's a step-by-step guide to what's involved, beginning with the collection of the nuts. Black walnuts have a yellowish-green husk that turns dark brown as it ages. They are about two inches in diameter, and fall to the ground when they're ready to harvest, which is September-October for most of the U.S.
Black walnuts contain tannins, a juicy substance, that will stain your hands for days, so be sure to put on a pair of work gloves before you get started. Then, simply gather all the black walnuts that are laying on the ground, and place them in bags or baskets, so you can haul them home for processing. Once you've gathered your black walnuts, it's time to remove the husks. Put on an old pair of shoes that you don't care about, and roll the first walnut under your foot. The husk should slip right off. Then, repeat the process with the remaining walnuts. If you have a lot of walnuts to do, you can also lay them out on the driveway and drive your car over them several times to remove all of their husks at once. This works well, but will stain your driveway, so just keep that in mind, if you decide to go this route. Note: Don't worry if you see any worms inside the husks. These are from husk flies, but they seldom affect the nuts. The nuts are very well protected by their tough shells. Toss all of the husks in the trash when you're done. You may be tempted to throw them on your compost pile, but don't do it; they contain a chemical, called juglone, which inhibits plant growth. It's the reason you don't see many things growing around black walnut trees. With the husks removed, you're now left with just the walnuts in their shells and all the black gunk that's attached to them. Place the nuts in a bucket, and spray them off with a hose to remove as much of the gunk as you can. Toss any nuts that float; it's a sign that the nut meat didn't form properly. Then, lay the walnuts out to dry. If you opt to leave them outside to dry, make sure they're protected from direct sunlight, rain and squirrels. A screened in porch or outbuilding is ideal. Give the black walnuts two to three weeks to dry and cure before you store or crack them. This will ensure that you don't lose your harvest to mold. Once your walnuts have had plenty of time to cure, you can store them as is in a cool, dark place for up to a year (though they may turn rancid before then). To crack your walnuts, place them on the ground pointed end up, and hit them with a hammer until they crack, or place them in a vice grip and tighten it until they give. Then, careful pick out the nut pieces. Walnut shells are very hard, so this process takes time. It's very common for the nut meat to get broken into pieces during the cracking process. If you really want whole nuts, soak the walnuts for a couple hours before you crack them. The nuts will absorb a small amount of water, and be less likely to break. If you decide to go this route, allow the nuts to sit out at room temperature for a day before you freeze them, so they don't end up with freezer burn. Interested in Learning How to Harvest Other Types of Nuts? How Do You Harvest and Store English Walnuts? Potato Ptuesdays, Anyone? This Baked Potato Technique is Super Quick!